It’s not always easy to come up with a great content idea that will lead to an interesting post, especially when there’s pressure for time or lack of inspiration. But there is good news! Social media inspiration is everywhere, you just have to know the right places to look. 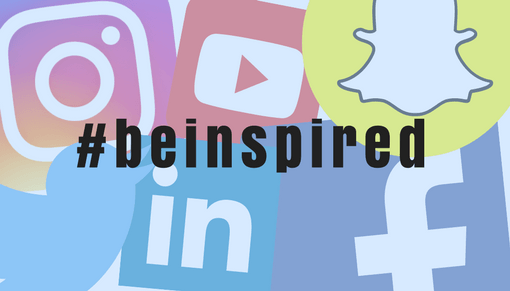 That is why I’ve compiled this list of 5 ways to find inspiration for your next social media post. First things first, when you are coming up with new social media ideas, you must always remember your audience. You may think to yourself, “This post is so funny and great, I have to share it!” But after you get that thought, you need to think it through. Yes, it may be an interesting post to you, but is it appropriate for your audience? If the answer is yes, share away! But if your questioning it, it may be time to revisit the idea. Now that we have our target audience in mind, we can begin the search for social media post inspiration! Looking at competition is one of my favorite ways to get inspiration for content. These are the businesses that are trying to engage with and attract the same customers as your business is. So it’s an opportunity to see what works for your industry and what types of content people in that industry are engaging with and responding to. For example, if you have a local restaurant, and you take a look at what is working for your competition, you might find that users responded to “real” photos and images of food and people, rather than stock photos and posts with no substance. Is your business on Instagram or Twitter? If so, you may be familiar with the proper use of hashtags. Hashtags are used to connect posts with one another according to that specific tag. They are also a great way to find inspiration for your next post. Try looking up hashtags that are relevant to your business. For The BLU Group, an advertising and marketing agency, I could try searching terms like: #marketing, #adagency, and #agencylife. Take a look through the results, you just mind find inspiration for a great idea! If your obsessing over what your next post is going to be and if it’s going to be a good idea. Just stop, take a few breaths, and relax. Now with a clear head take a piece of paper or open up a blank document and make a list of every single idea that comes to mind. Every single one. There’s time for editing later. After you have created your list of ideas, go through each one and think about how it relates to your audience. Think about how the idea will add value to people viewing the post. Keep this list handy and constantly add to it and edit it. This is a great way to brainstorm and it really works! People like to talk about topics that are trending. That’s why we call them “trending topics.” So why not join the conversation! On Facebook and Twitter, you can view trending content on the news feed if your on Desktop, and trends show up if you tap the search bar on mobile. Once you’ve found where the trending topics are listed, you can click on them to see what others are posting about that topic. A great way to think of new content ideas is to take a look at what your followers have responded to in the past. For Facebook, take a look at Facebook Insights, Twitter Analytics for Twitter, and Instagram Analytics for Instagram. See what posts have the highest reach and impressions. Also take a look at which posts got the most engagement. Once you’ve discovered which posts have been the most successful in your profile’s past, you then need to discover why they were successful. Those reasons will help you in your future posts! Now go update your social media calendars and start creating amazing content! And if you need social media help, don’t hesitate to give us a call at 608-519-3070.